Kögel is gradually introducing the new and reliable external frame and body already known from the Kögel Lightplus for its Cargo, Mega, and Light platform trailers. The Kögel tarpaulin semi-trailers are also receiving further optimisations as part of the new NOVUM generation. NOVUM not only introduces the new external frame and body but also the new, optimally designed Kögel modular system with optimised, uniform new modules, assemblies, and components. 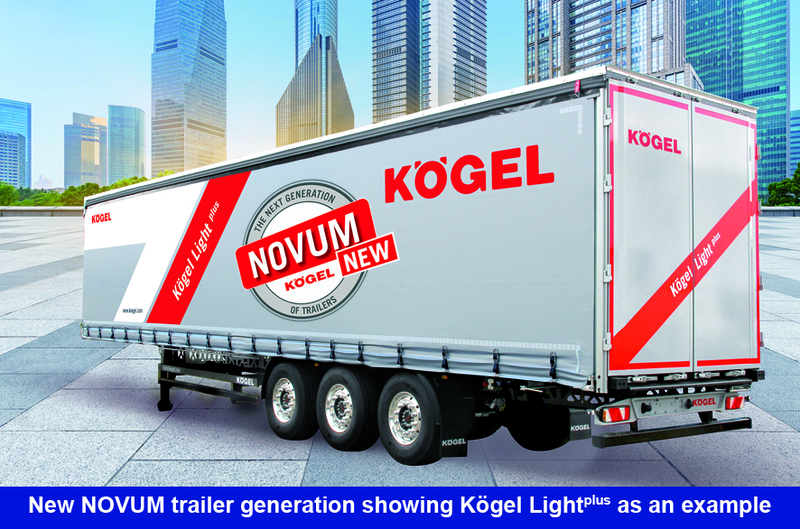 This enables an extremely high level of individualisation for the NOVUM generation trailers, with Kögel addressing the wide ranging requirements of the market. In future, all NOVUM generation vehicles will have a sturdy, torsion-resistant welded frame with full-width cross beams for high payloads and concentrated loads. Even more stability is provided by a new, slimmer yet stronger rear cover plate as well as the new air and lighting console on the front wall, which transfers forces along the side member to the frame. The new external frame profile greatly increases the accessibility of the VarioFix lashing points, allowing the cargo to be lashed to the VarioFix perforated steel external frame with the tarpaulin closed and also in combination with the optionally available drop sides. When using belts with claw hooks, the drop sides need to be open to attach them. The drop sides can remain closed when attaching belts with flat hooks. The 13 pairs of lashing shackles included as standard are now available with grip hooks at the sides for easier handling and have a tensile force of 2,500 or 4,000 kilogrammes respectively. Naturally, all NOVUM generation trailer frames have long-term protection from corrosion thanks to the nano ceramic technology in addition to cathodic dip-paint coating with a subsequent coat of UV varnish. In the basic design, the front wall, including the front volume corner posts, the rear corner posts, and the rear wall door portal are made of aluminium. The standardisation of the corner posts with and without a lifting roof results in the following benefits. Particularly in conjunction with a lifting roof, weight savings are made. In addition to that, it is easier to position pallets along the front wall with side loading. Furthermore, all the drop side spacing is now a standard size on NOVUM generation vehicles. This means that differently sized slats are a thing of the past. The slat pockets can be arranged flexibly using a perforated profile on the corner posts and in the slat storage console. Naturally, the new semi-trailer generation also has a DIN EN 12642 Code XL load-securing certificate. Kögel is rolling out this update gradually for all Cargo, Mega, and Light variants. The Kögel Lightplus is already available. As of March, the Cargo Coil and Cargo Coil Rail will move to the NOVUM generation. Other variants of the NOVUM generation will then be available by/as of the IAA Commercial Vehicles 2018. Kögel is one of the leading trailer manufacturers in Europe. Since it was established in 1934, the company has manufactured more than 550,000 trailers. With its commercial vehicles and solutions for freight-forwarding companies and the construction industry, the company has been providing ‘Made in Germany’ engineering quality for more than 80 years. During this period, it has maintained its passion for transport and innovation, enabling it to offer proven, long-lasting added value to freight-forwarding companies. The company headquarters and main production facility of Kögel Trailer GmbH & Co. KG are located in the Bavarian town of Burtenbach. Kögel also has factories and offices in Ulm (Germany), Duingen (Germany), Chocen (Czech Republic), Verona (Italy), Zwolle (Netherlands) and Moscow (Russia).